There’s nothing fishy about the new Lucky Koi slot from Microgaming! You won’t need a rod and reel to play, but if you manage to land the right Lucky Koi on Microgaming’s new video slot of the same name, then you could be celebrating the start of 2014 with a win of up to 125,000 coins! Microgaming’s latest slot is a 5-reel, 25-payline game and is an American style (hybrid) slot machine that combines slot action with bonus games and features for a more all-consuming experience. The inspiration for the game are the beautiful water gardens of the Far East and the star of the show is their most prized and often expensive inhabitants, the beautiful Koi Carp. However, it is not just these bright and colourful aquatic creatures that adorn the reels. Water lilies, lanterns (which act as a scatter symbol), frogs, dragonflies and ornate fans all help bring to life the eastern theme of the game. This is further enhanced by a classically eastern soundtrack and fantastic sound effects. The Lucky Koi, which gives the slot its name, acts as the in game wild, triggering extra wins for those when it lands on any of the five reels. The stone lantern scatter symbol activates the two bonus games. You can select from a choice of a random number of test spins (between 10 and 30 – with the number you receive shown before you make your choice). This option also includes a multiplier of up to 5x for any winnings you may make in the test spin section. 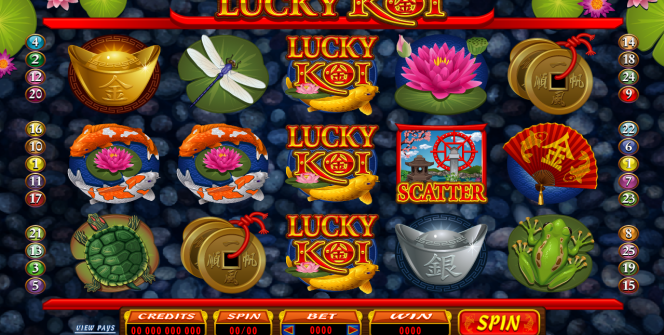 Alternatively, you can opt for the Koi Bonus Game, where you get to pick and catch between three and six carp to earn yourself a cash prize, or another pick from the fish in the pond. With a maximum cost of 25 coins per spin, this is a game suited to all levels of slot players and its hybrid gaming action ensures that it will have real appeal across the board. 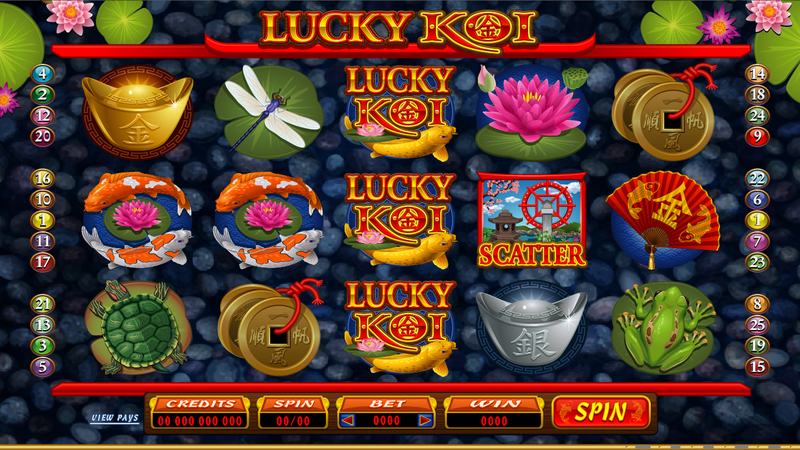 Lucky Koi hits Microgaming casinos this January.